A-Ward’s revolutionary MiSlideTM horizontal container loader smoothly transfers a full load directly into a shipping container in less than five minutes; saving valuable time and space, and boosting your productivity. Holds 5% more materials than competitors. Loads in less than five minutes. Engineered to withstand the toughest of loads. Eliminates double-handling. Reduces manpower required. Improves operator safety. Improved loading accuracy. Requires minimal yard space. Minimal material movement in transfer. 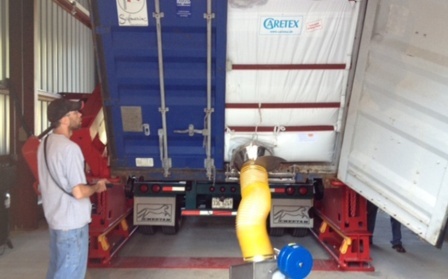 Loading both 40ft or 20ft containers to maximum capacity. 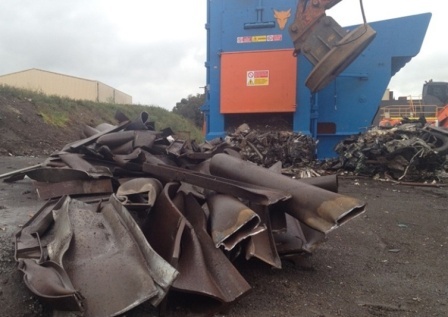 Loading a range of materials, including: light gauge and HMS steel, non-ferrous materials, baled plastics, rubbish and waste, recycled paper, woods and logs, palletized goods, and more. 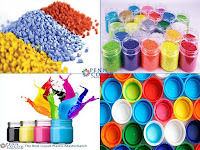 For other types of materials, see Industries. 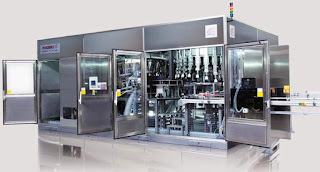 Conventional container loading involves tricky maneuvering - but MiSlideTM uses hydraulic alignment control to effortlessly align the chamber box to the truck. Watch MiSlideTM in action. in action. MAXIMUM WEIGHT, MINIMAL WASTE With MiSlide’s greater loading accuracy, you’ll instantly reduce spillage rates. 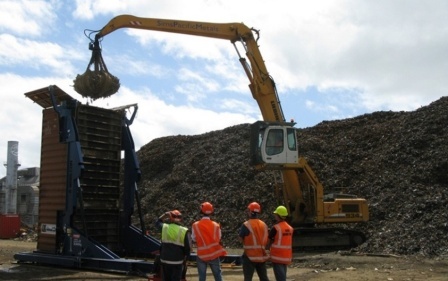 It also eliminates double-handling by weighing every load before it’s transferred to the container. 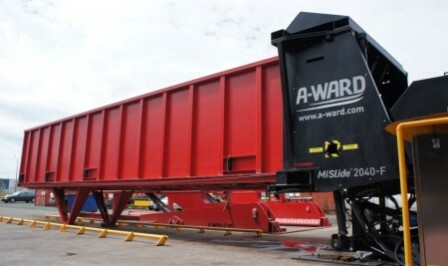 ENGINEERED FOR SAFETY A-Ward’s intelligent remote control system allows a single operator to complete the loading, weighing and transfer – all from the safety of the controller’s cab. DESIGNED TOUGHER MiSlideTM is designed and built to take the knocks. Curved chamber walls provide greater strength and minimize any container damage. While others use horizontal telescopic rams (which wear out quickly and are costly to replace), our patented, single stage rams have fewer moving parts and a longer life.